Nearly fifty years after being sworn in as president of the United States in the wake of John F. Kennedy's assassination, Lyndon Baines Johnson remains a largely misunderstood figure. His force of personal­ity, mastery of power and the political process, and boundless appetite for social reform made him one of the towering figures of his time. But he was one of the most protean and paradoxical of presidents as well. Because of his flawed nature and inherent contradic­tions, some claimed there were as many LBJs as there were people who knew him. Intent on fulfilling the promise of America, Johnson launched a revolution in civil rights, federal aid to education, and health care for the elderly and indigent, and expanded immigration and environ­mental protection. A flurry of landmark laws—he would sign an unparalleled 207 during his five years in office, including the Civil Rights Act of 1964, Voting Rights Act of 1965, Elementary and Second­ary Education Act, Head Start, and Medicare—are testaments to the triumph of his will. His War on Poverty alone brought the U.S. poverty rate down from 20 percent to 12 percent, the biggest one-time drop in American history. As president, he was known for getting things done. At the same time, Johnson's presidency—and the fulfillment of its own promise—was blighted by his escalation of an ill-fated war in Vietnam that tore at the fabric of America and saw the loss of 36,000 U.S. troops by the end of his term. Presidential historian Mark K. Updegrove offers an intimate portrait of the endlessly fas­cinating LBJ, his extraordinarily eventful presi­dency, and the turbulent times in which he served. We see Johnson in his many guises and dimen­sions: the virtuoso deal-maker using every inch of his six-foot-three-inch frame to intimidate his subjects, the relentless reformer willing to lose southern Democrats from his party for a generation in his pursuit of civil rights for all Americans, and the embattled commander in chief agonizing over the fate of his "boys" in Vietnam—including his two sons-in-law—yet steadfast in his determination to thwart Communist aggression through war, or an honorable peace. 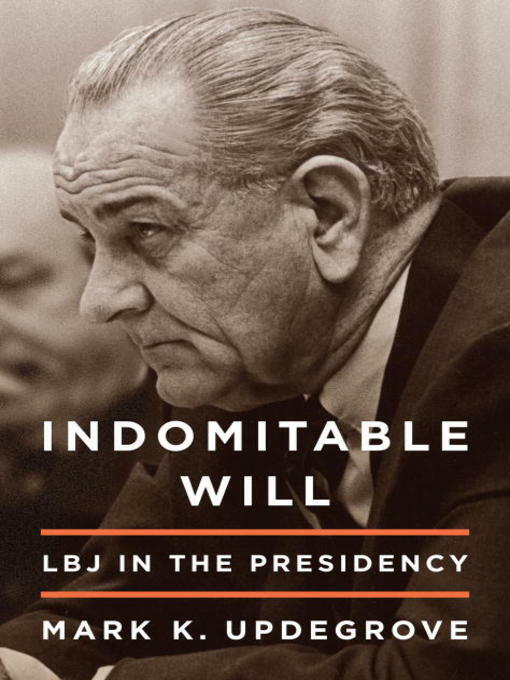 Through original interviews and personal accounts from White House aides and Cabinet members, political allies and foes, and friends and family—from Robert McNamara to Barry Goldwa­ter, Lady Bird Johnson to Jacqueline Kennedy—as well as through Johnson's own candid reflections and historic White House telephone conversa­tions, Indomitable Will reveals LBJ as never before. " For it is through firsthand narrative more than anything," writes Updegrove, "that Lyndon John­son—who teemed with vitality in his sixty-four years and remains enigmatic nearly four decades after his passing—comes to life."